New York: Amazon.com Inc unveiled its long-awaited tablet computer on Wednesday with a $199 price tag, potentially cheap enough to give Apple Inc’s iPad some serious competition for the first time. Amazon chief executive officer Jeff Bezos also unveiled the Kindle Touch, an e-reader with no buttons and a touch screen starting at $99, along with a basic Kindle e-reader at a new price of $79. “These are premium products at non-premium prices," Bezos said. “We are going to sell millions of these." Amazon shares rose 3.2% to $231.29 in morning trading, while Barnes & Noble, maker of the Nook e-reader, dropped 6.2% to $12.39. Analysts expected the tablet to be priced around $250, roughly half the price of Apple’s dominant iPad, which starts at $499. The Nook Color e-reader costs $249. 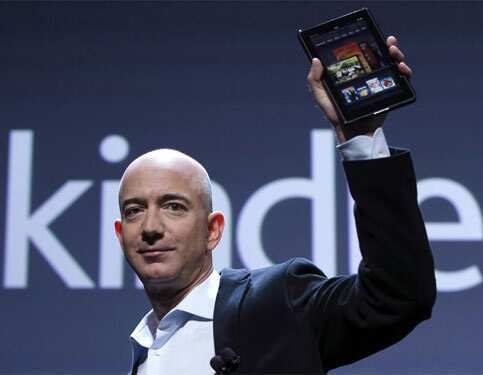 Having its own tablet is important for Amazon because the company has amassed a mountain of digital goods and services that could be sold through such a device. As the world’s largest Internet retailer, a tablet might also encourage Amazon customers to shop online for physical products more often.